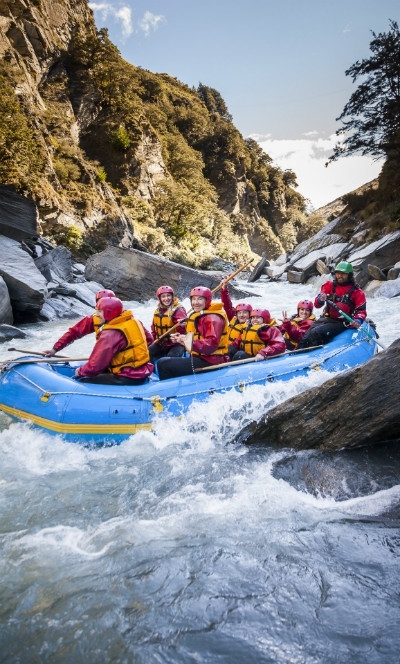 Exciting half-day rafting adventures on the Kawarau and Shotover Rivers in Queenstown, great for first-timers, and with a heli-rafting option into Skippers Canyon. Post-raft sauna is a big plus. Challenge Rafting Queenstown offers two superb rafting trips. The Kawarau River option, with four rapids of grade 2-3, is an exhilarating five hour journey through this beautiful valley, which includes a view of the famous bungy bridge, which you'll paddle under (but not while someone's leaping off it, obviously...). Your trip will climax at the 400m Dog Leg Rapid, the undeniable highlight of this high-octane river rafting adventure. Both trips include transfers to and from your start/finish points, all equipment and specialist clothing, safety briefings, professional and friendly guides and, most welcome, a gorgeous hot sauna (and shower) back at base. Add to that the option to take advantage of the professional photo service on offer, to document your trip properly, and you've got everything you need for the ultimate wet and wild day out in Queenstown. *Heli-Rafting is the only Shotover River option available during winter as Skippers Road is closed. For full pricing details and bookings please visit www.raft.co.nz or call +64 3 442 7318.